Daunorubicin (DNR) is an anticancer drug which is widely used for treatment of acute myeloblastic leukemia (AML) and acute lymphoblastic leukemia (ALL). Disposable electrochemical sensors were used in our study to detect DNR-nucleic acid interactions by differential pulse voltammetry (DPV). 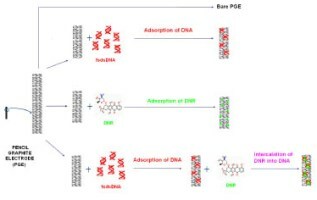 For surface confined interaction between DNR and DNA, electrochemical impedance spectroscopy (EIS) was applied and results were compared with those from DPV.